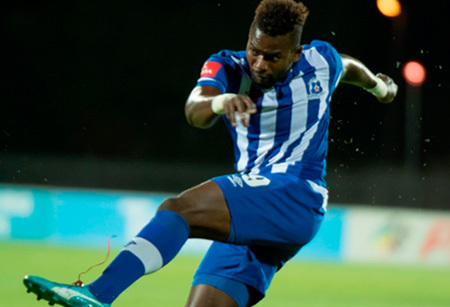 Maritzburg United were unfortunate to go down 1-0 to Black Aces at the Mbombela Stadium on Wednesday night. With both sides eyeing maximum points, the first opening 30 minutes in Mbombela were a cagey affair, with some tough challenges taking place in the middle of the park as the sides battled for supremacy. It took until the 15th minute before the first chance on goal materialised, but Mohammed Anas’ effort was comfortably saved by Jackson Mabokgwane. AmaZayoni enjoyed a small period of dominance around the midway stage of the opening stanza, but could not capitalise on the corners they earned, while Onyekachi Okonkwo failed to test United keeper Virgil Vries as he sent his free kick into the stands. Five minutes before the break and the Team of Choice had the best chance of the first half, but Mabokgwane did well to deny Anas. The hosts were forced in to making an early change as a knock to defender Vincent Kobola saw his night ending prematurely, the right back replaced by another former Moroka Swallows man, Roger Da Costa. Aces were nearly in front just before half time, but Denis Masina was to see his parting shot going just inches wide of goal. Maritzburg started the second half with a renewed sense of urgency and were unfortunate not to go ahead on 52 minutes when Anas’ shot struck the woodwork. As the game moved towards the final quarter, the Mpumalanaga side were able to get in two efforts on goal, both through Collins Mbesuma, but his first shot went wide while his second effort, which saw Abia Nale involved in the build-up, was saved by Vries. But Mbesuma was not to be denied on 70 minutes, making no mistake to hand Aces the lead after he put the ball past the United stopper. It was Thokozani Sekhotlong who led the attempted fight back for Maritzburg, but he was unable to beat Mabokgwane with his shot five minutes after the goal. There was some backs-to-the-wall defending late on for the home side as the Team of Choice threw everything into attack as they looked for an equaliser, but it proved to be in vein as the Aces defence held firm as they claimed the crucial three points. Black Aces: Jackson Mabokgwane, Vincent Kobola (Roger da Costa 42’), Eddie Ngalo, Lehlohonolo Nonyane, Bhongolwethu Jayiya (Valery Nahayo 80’), Edwin Gyimah, Aubrey Ngoma, Thanduyise Khuboni, Dennis Masina (Abia Nale 56’), Onyekachi Okonkwo, Collins Mbesuma. Maritzburg: Virgil Vries, Abel Mabaso, Mohammed Awal (Thokozani Sekotlong 64’), David Booysen, John Pantsil, Ryan De Jong (Nhlanhla Vilakazi 73’), Kurt Lentjies, Mondli Cele (Mohau Mokate 65’), Deolin Mekoa, Philani Zulu, Thamsanqa Mkhize.